The library is hosting three events on Reading Day (Wednesday, May 2) to encourage you to take some time off from studying to reboot your mind and body. Please drop in to as many as you can throughout the day! Coffee, tea, and snacks will be available in the lobby from 11:00 a.m. – 1:00 p.m. (or until supplies last). Bring your own reusable water bottle to refill at one of our three water bottle filling stations. You may think you’re being productive when you work for long stretches at a time on a single task (like cramming for an exam or writing a paper), but taking frequent breaks will actually improve your focus, attention, and performance! The library is hosting three events on Reading Day to encourage you to take some time off from studying to reboot your mind and body. Please drop in to as many as you can throughout the day. Refuel and recharge! Coffee, tea, hot chocolate, and snacks will be available in the lobby from 11:00 a.m. – 1:00 p.m. (or until supplies last). Bring your own reusable water bottle to refill at one of our three water bottle filling stations. Take a break from studying to make your own buttons using the library’s button makers. We’ll have pre-made designs, magazines, and coloring books for you to use, or you can put markers to paper and create your own design. This activity is sure to get your creative juices flowing! Our furry friends Kodiak and Echo (and their humans Marty and Karl) and are returning to the library! Studies have shown that interacting with animals can improve our interpersonal interactions and mood, reduce cortisol, lower heart rate and blood pressure, reduce anxiety, enhance empathy, and improve learning. Don’t just take our word for it, come and see for yourself! Drop in to the art gallery to hang out with these two giant, lovable Bernese Mountain Dogs. The staff of the Bentley Library invite you to three Reading Day stress relief activities on Wednesday, May 3rd. Please drop in to as many as you can throughout the day! Coffee, tea and snacks will be available from 11:00 a.m. – 1:00 p.m. (or until supplies last) in the atrium in front of the art gallery. Take some time to refresh and refuel! Take a break from studying to make-your-own final exams flair! The library has just purchased two button making machines and we are unveiling them for a little stress-relief session on Reading Day. We’ll have pre-made templates, magazines, and coloring books on-hand, or you can put Sharpie to paper and design your own. 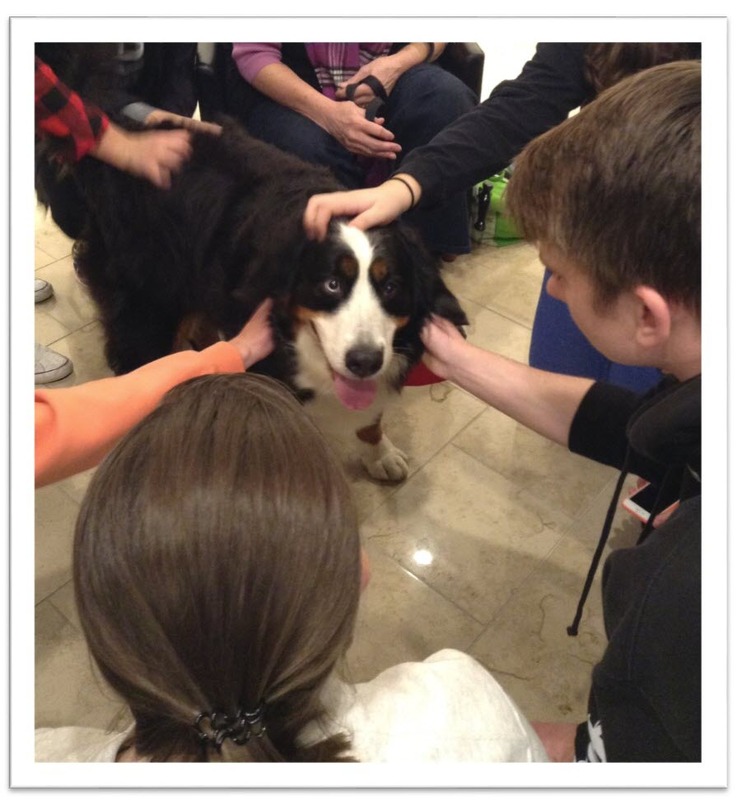 We are happy to host another therapy dog stress-relief session at the library. Stop in to the art gallery to “Take a Paws” with two lovable Bernese Mountain Dogs, Kodiak and Echo. 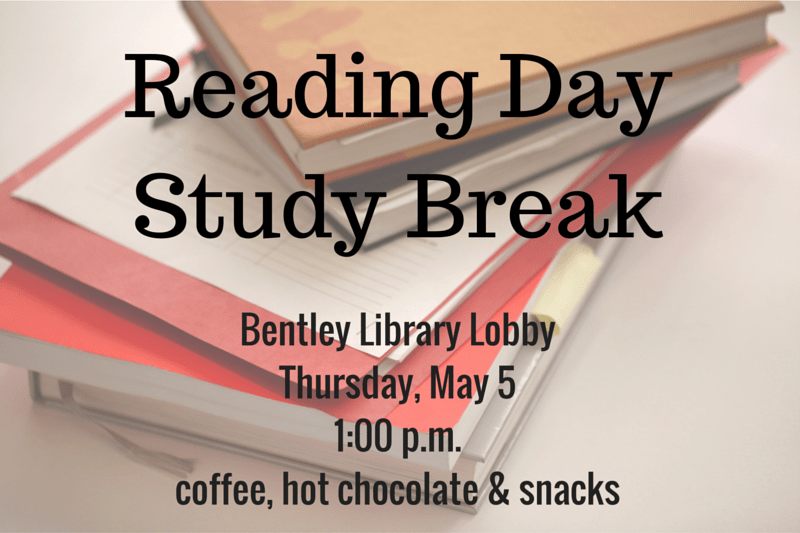 The staff of the Bentley Library invites you to a Reading Day study break. Coffee, hot chocolate and snacks will be available on Thursday, May 5, at 1:00 p.m. in the atrium in front of the art gallery. Take some time to refresh and refuel! On exhibit from May 2 – June 20 June 17 in the RSM Art Gallery is an installation of dog portraits and Cape Cod landscapes by artist Linda Collins. In lieu of a formal opening reception for the exhibit, Linda Collins will be present at Take a Paws on May 5. If you would like to meet Ms. Collins or learn more about her artwork, please visit the gallery during that event. You can also see more of the artist’s work on her website and her blog. Painting of Kodiak, a Bernese Mountain Dog. Linda Collins, a Cape Cod resident, has been painting for the past ten years. She began by taking portraiture classes at the Cambridge Center for Adult Education. “If you are going to take up something new, why not start with the most challenging subject matter!” From people she moved on to painting pets, still life, and more recently, landscapes. “The dogs are always what I go back to though. If I am struggling with something else, painting a dog always gets me in a happy place.” This show represents the full range of her painting, with the large canvas landscapes being her most recent. Linda, the Assistant Director of the Falmouth Public Library, is a member of the Falmouth Artists Guild and the American Impressionist Society. She has had her work in juried shows both locally and nationally, including the “6 Inch Squared Exhibit” at the Randy Higbee Gallery in Costa Mesa, CA and the “Best and Brightest” at the Scottsdale Artists’ School in Scottsdale, AZ. We are excited to welcome therapy dogs Kodiak and Athena back to the Bentley Library for another “Take a Paws” stress-relief session! 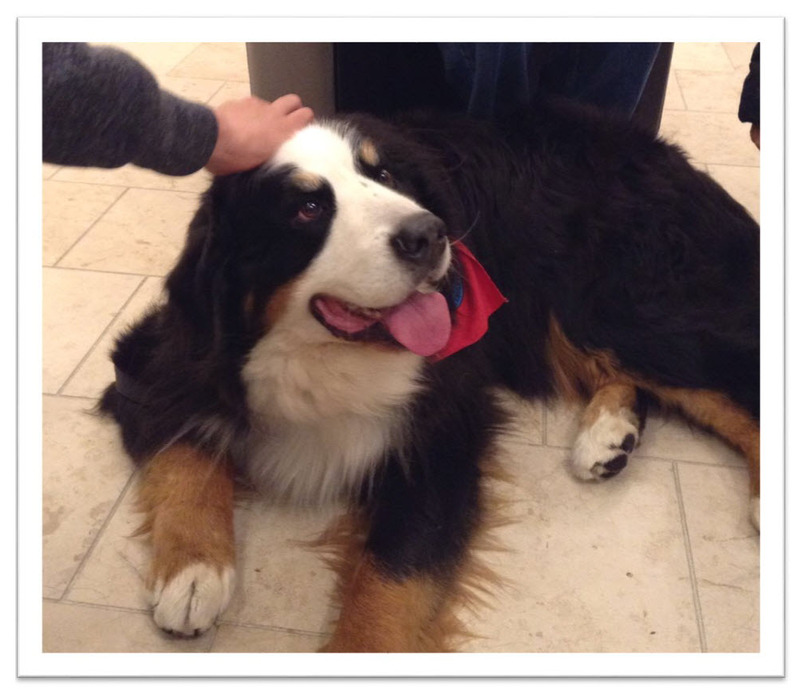 Thanks to the Center for Health and Wellness, you can enjoy some Bernese Mountain Dog love in the art gallery on Thursday, May 5, from 4:00 p.m. – 6:00 p.m.
It’s posited that human-animal interaction activates the oxytocin system, leading to these positive effects. * Don’t just take our word for it, come and see for yourself. Stop by the library on Reading Day for your daily dose of dogs (and oxytocin)! 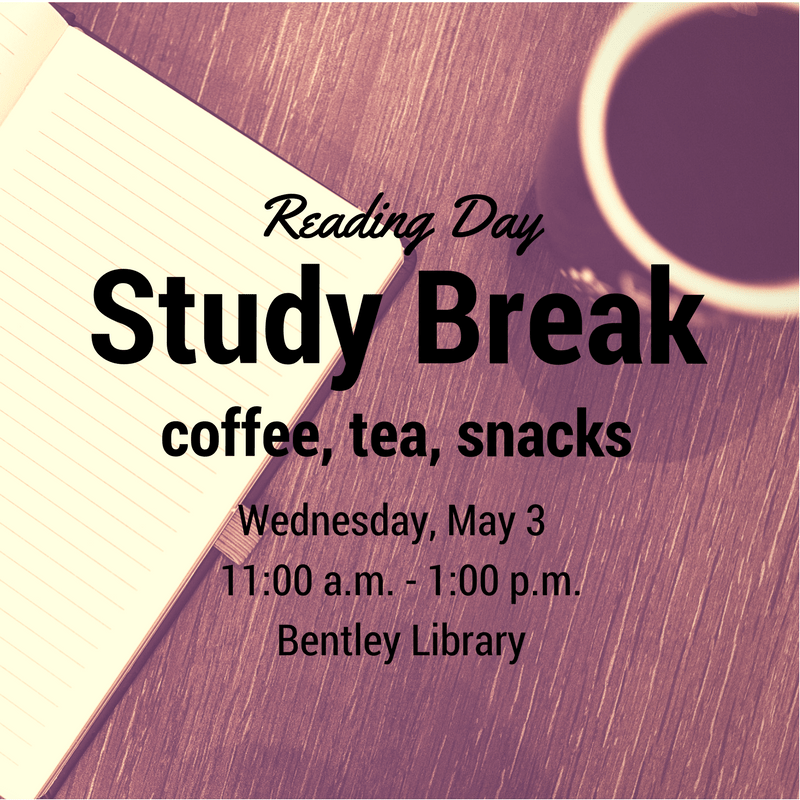 The staff of the Bentley Library invites you to a Reading Day study break. Coffee, tea, hot chocolate and snacks will be available on Tuesday, December 15th, at 2:00 p.m. in the atrium in front of the art gallery (while supplies last). Take some time to refresh and refuel!